This story began more than a half century ago, it’s about six decades in the making. I was an infant when I spiked a high fever that eventually dropped. About 15 years later when I was 16 years old, teenaged me woke up and stumbled when I got out of bed. My balance was somehow out of whack and I had to (briefly) reteach myself how to walk by putting my hands on walls as I moved. But that was just a symptom of the bigger problem. Overnight, the hearing in my right ear was gone, no more, disappeared. We went to doctors time and again and were told that my hearing could not be restored. They guessed the cause could have been heredity or loud music. It could have been that fever I had as an infant. But there was nothing to be done. Hearing Test February 14, 2018. Fast forward to 2017 and my vision insurance at work indicated it would pay for hearing aids (effective January 1, 2018). That got my attention and I decided to try again to seek medical attention and have my hearing checked. 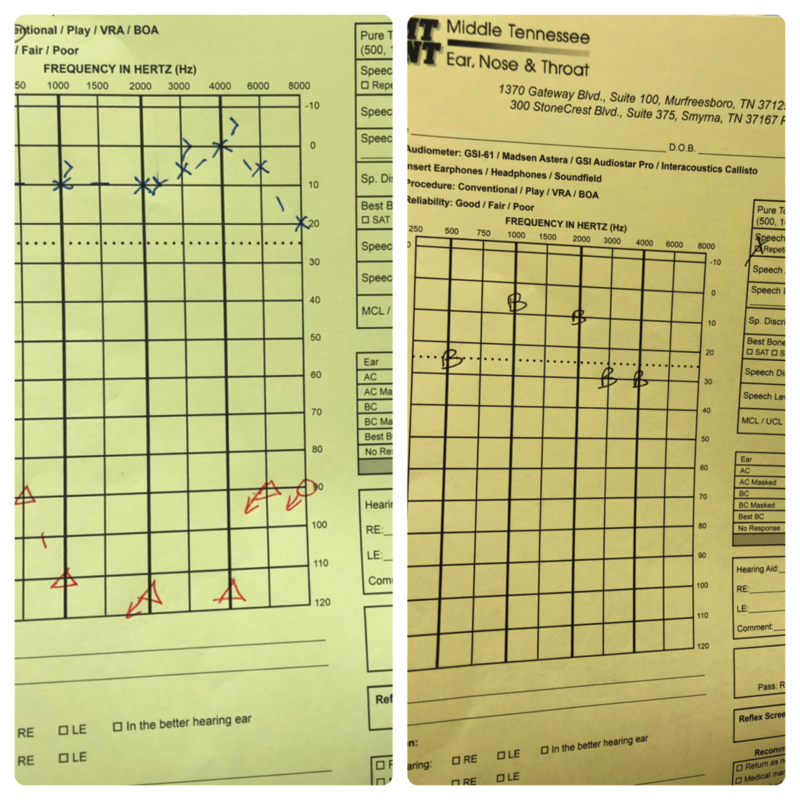 I was very excited to make an appointment with Audiologist Vicki Ford of Middle Tennessee Ear Nose and Throat and for the first time in decades, I took another hearing test on Valentine’s Day 2018. 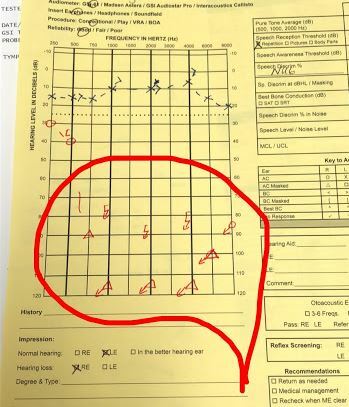 The results showed perfect hearing in my left ear and profound loss in my right ear. I was told that when you have hearing loss due to loud music, the loss is gradual. Because mine was overnight, it was most likely due to that high fever. I learned I was not a candidate for a hearing aid because of the type of loss. However because of single sided hearing loss (with perfect hearing in the other ear) there were a couple of options. I could have selected a CROS system, which would transmit sound from the bad side to the good ear – a radio transmission essentially and one that would require two hearing aids. Or a baha cochlear implant that is directly implanted in the bone of my skull. I wanted the implant because it would transmit sound up my skull bone and go directly into my brain’s auditory area. I felt this would be the closest I could get to actually hearing again. We began the insurance process shortly after that hearing test. The vision insurance didn’t cover that type of procedure at all. So for kicks we applied to my health insurance. I was turned down fairly quickly and my heart broke. No one really knows how much I grieved over losing that chance to hear again after 42 years of profound deafness in my right ear. But the professionals I was working with – now expanded to include Audiologist Aurora Phelps of MTENT and people at Cochlear Ltd. – appealed the decision. A second rejection. Then a third rejection. Cigna Insurance just wanted no part of it and I finally waved my white flag. I just could not afford the cost without the help of insurance. And why in the world is there insurance for teeth, for vision, for health, but NOT for hearing??? In my job, part of my responsibilities include human resources and benefits. So after the crushing disappointment of being rejected three times, fast forward to October of 2018 and open enrollment period for health insurance. As I was reviewing changes to our insurance plan to share with our staff I noticed the addition of “bone implanted hearing devices” as a new benefit. When I read the letter from Cigna, my hands began shaking. I couldn’t believe it! They gave me until April 22, 2019 to get it done. The thought of hearing again after (now) 43 years is stunning to me. But then the insurance dance began again. Cigna approved the surgery, but not the device. They didn’t approve the device itself because I was over 18 years old. Wow how’s that for some age discrimination?? It was like they said, “Sure you can have a prosthetic limb, but we’re not paying for the limb.” We tangoed and we balleted and we tap danced across the floor. We sent documentation, medical need letters, the entire history of my life it felt like. We tried everything. But still they only approved the surgery and not the device. But I was determined to move forward this time not knowing if in the end I was going to have to pay $3600 out of pocket or $10,000 out of pocket. (The amount is closer to $10,000!). I don’t know who you are or what you do for a living if you can just write a check for $10,000, but that is not me, sadly! I had to raid my retirement savings and will pay dearly at tax season next year for the early withdrawal – even when it’s considered a medical event. During this insurance process, I again went in for another hearing test required by Cigna. The image on the left was the original showing profound deafness, the image on the right was my hearing test using the baha cochlear device strapped to the exterior of my head. Hearing test with baha results on the right. This past Wednesday, on April 10, 2019 – with 12 days to spare until my insurance approval period ran out – I checked in at the ambulatory surgery center for the procedure. Labeled “major surgery” you still get sent home the same day. That still blows my mind to this day how patients are now shuttled in and back out immediately after major surgery. So the surgery itself … an incision about 2-inches long was made above my ear. Given what I’ve looked at in the mirror and how it feels, I believe my scalp was pulled back for the surgeon to drill directly into my skull for the magnet implant. The magnet is anchored to the bone so the device can “stick” to my head. My scalp / skin was then put back in place and stitched up. It has been a somewhat painful recovery. Between itching stitches, the pain in my skull, and (oh dread) not being able to wash my hair for a week (I know, right?! ), I am definitely looking forward to recovering completely. On April 26 at 3:30 p.m. the device itself will be attached by the audiologist and tuned to meet my hearing needs. At this point I’ve decided to go ahead and record it. I’m considering going facebook live as they turn it on for my family who can’t be there. So that’s my journey. It’s not over yet. I am extremely thankful for MTENT and their staff, for the Cochlear Ltd folks who have helped. And yes to Cigna because without their support for at least the surgery, I couldn’t have had this done. And I thank anyone who took the time to read this even though it’s not really LaVergne per se… it’s about someone who lives here in LaVergne. If anyone who has this type of hearing loss ever wants to talk about the procedure, please reach out. "A Different but True Story About Hearing Loss", 5 out of 5 based on 2 ratings. Love following your story. My cousin had these implanted in both ears at maybe 16 or 17, after a high fever as a toddler left her almost completely deaf in both ears. The procedure wasn’t around when she was a child, so she grew up actually learning to sign and read lips. Anyway, I know it was life-changing for her and she’s still doing great with the implants after 25+ years. I do agree it does seem crazy that drilling into your skull is considered outpatient surgery, though. Yikes! I’m so excited for you to take the last steps of this journey; you’re almost at the finish line! Sherry you brought tears to my eyes. Thank you for sharing this about your niece. This whole experience has been breathtaking… as in gasping for breath at different times throughout the process! As I woke from the anesthesia on Wednesday, I was literally gasping for breath complete with horrible rasping sound of trying to get air into my lungs… that had never happened to me before following surgery. It reminded me of how dangerous the whole process can be.